Marker on the trail – stream any which way you go. Imagine walking outside of your house, climbing a hill of maybe a hundred meters and seeing a completely different kind of habitat. If you live in a city near a park, this might actually happen but for most of us our home territory is pretty homogenous. 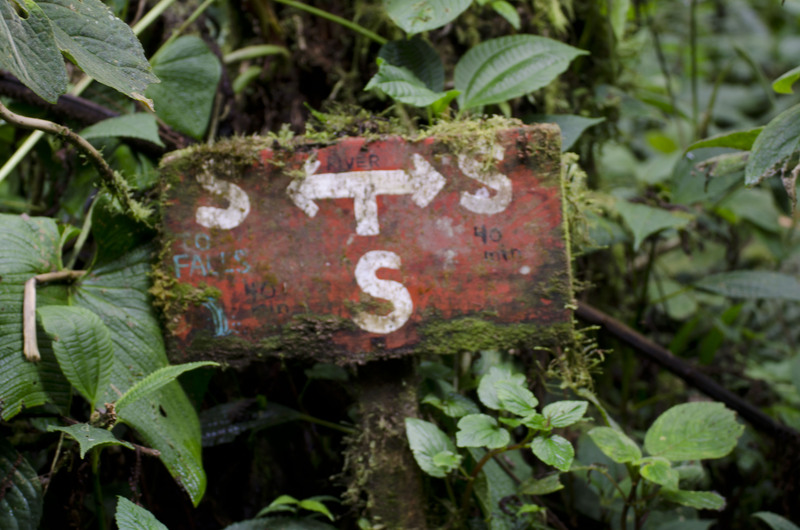 But that is what you’ll find at Bellavista Cloud Forest Reserve. Unbelievably, a change in a hundred meters can mean different trees, different insects, different frogs. And, believe it or not, it means the difference between seeing one kind of tanager and another. So while you can see many birds just by staying in one place, you increase your odds of seeing more by heading out to the many hiking trails on the reserve. And boy, are there a lot of trails! The trail to the waterfall. Rubber boots recommended. Our first afternoon, we headed out to the top of Bellavista Reserve to hike a trail that was partly submerged in water; we actually hiked up a stream so that we could see a beautiful little waterfall. Strenuous, to say the least. Even with the provided rubber boots, I managed to get my feet wet by stepping in a huge hole in the stream, one that everyone else managed to miss. 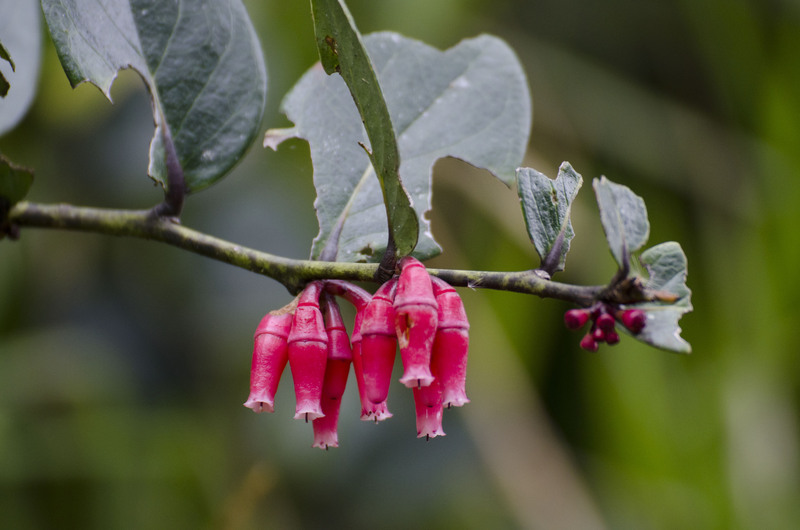 And while we didn’t see many birds that afternoon, we did learn a lot about the terrain and flora of a Cloud Forest. The primary forest, the part that has never been cut down, is very different from those parts that were once harvested for wood or turned into farmland. 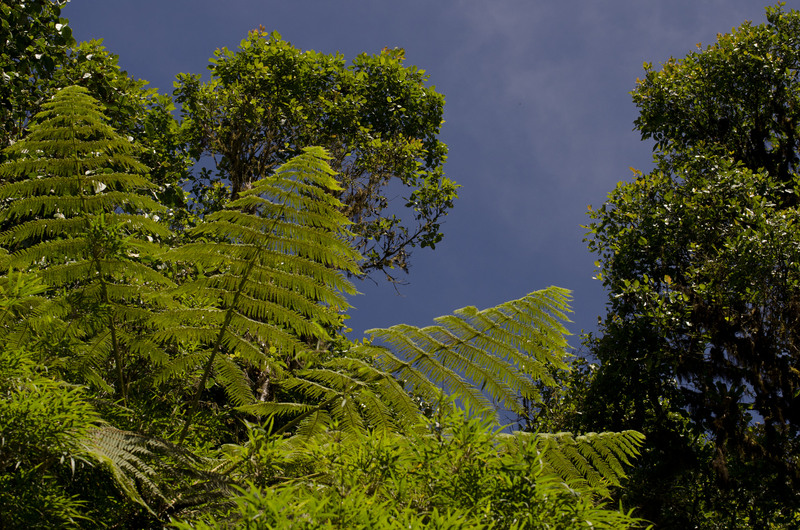 The trees are taller, the sun has a much harder time filtering down to the forest floor, and the entire feel of the land is very different, quiet except for the birds that you can hear high in the forest canopy, more humid, and more enclosed. On similar hikes in similar terrain during our weekend, we often heard hummingbird wings whirring right by our heads. 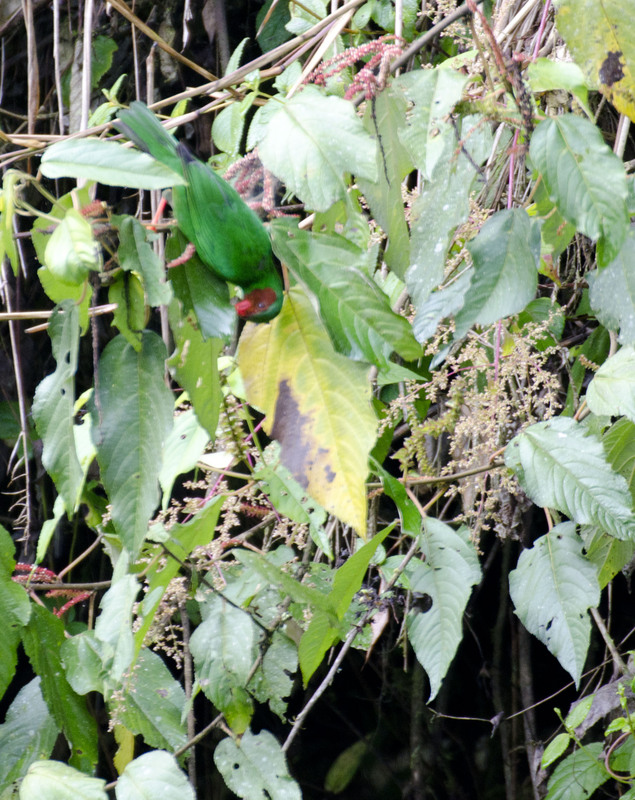 Only once did we see an actual hummingbird in this forest, their speed making it all but impossible to track them down. But the one we did see was spectacular; he hovered by our heads and afforded us the best possible view of his scalloped tail, brown center framed by white, and his lovely curved beak. This quick glance enabled us to later identify him as a Tawny-Bellied Hermit, a rare visitor to the sugar water feeders at the lodge. When just two or three of us hiked, we would always hear birds in the primary forest but it was a frustrating experience. The birds in these parts are shy and take great patience to see. Sometimes, we would manage to get a glimpse through our binoculars but knew that a photo was a near impossibility. The sounds of the birds were intriguing – one would call a sweet trill and if you listened carefully, you could hear birds echoing in response. The call lasted exactly 12 seconds according to one guide. 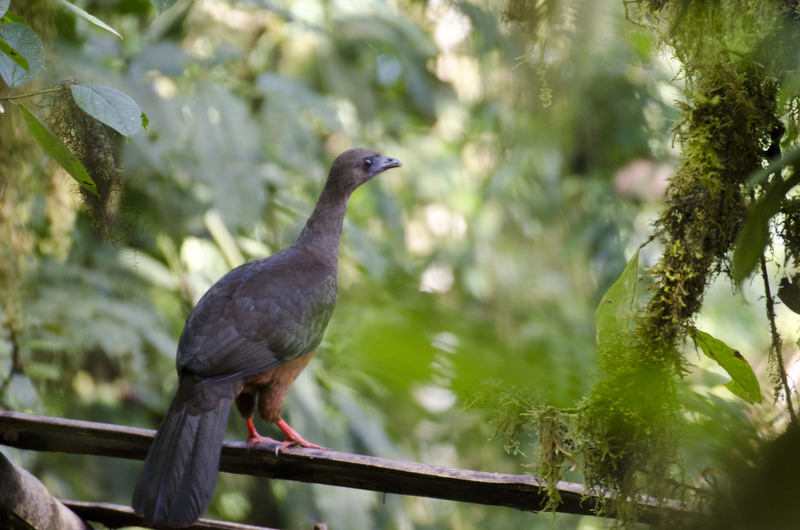 Unbelievably, this bird lives on the forest floor and I had an incredibly hard time imagining that strong, deep sound coming from a bird on the ground. I had thought a bird would need to be high in the canopy to be heard so far away. We did see both the Montane and Strong-billed Woodcreepers in these parts, most often tearing up one of the myriad of bromeliads while looking for insects. Looking across at primary forest. Can you see the Grass-green Tanager? We saw the most birds in more open areas. The first was right alongside the road which functioned as a trail for bikes and pedestrians with only a rare car making an appearance. It is here that we saw the Grass-green Tanager having a morning meal. Another smaller road parts ways and heads to the Research Station. Here we saw the most gorgeous Turquoise Jay. 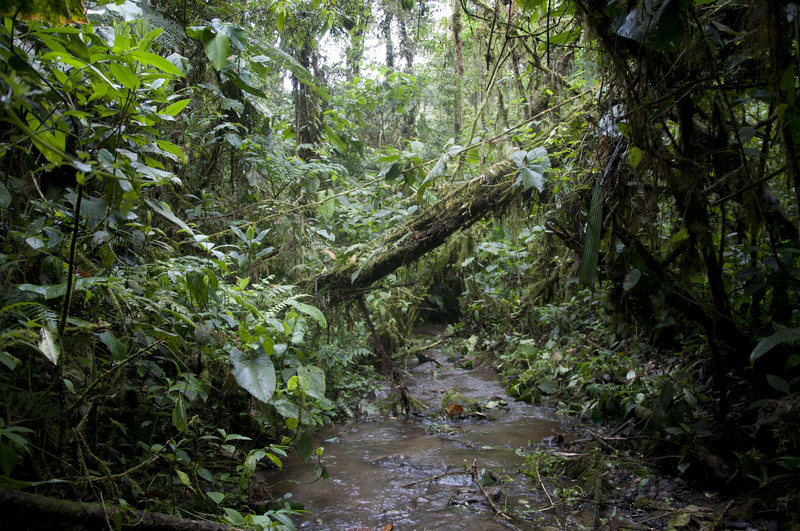 We ended up in this location no more than three separate times on the hunt for the Plate-billed Mountain Toucan. We never failed to hear the jay, loud and always willing to let other birds know that we were in the area. Perhaps I can blame that jay for scaring away the Toucans because we never saw them. Occasionally we could hear the clacking sound of their bills but always far in the distance. We also followed an illusive woodpecker, never quiet seeing him but following his persistent knocking from tree to tree as we walked along the path. Nevertheless, even without seeing the birds we could hear, the hike was always worth it for the view alone. 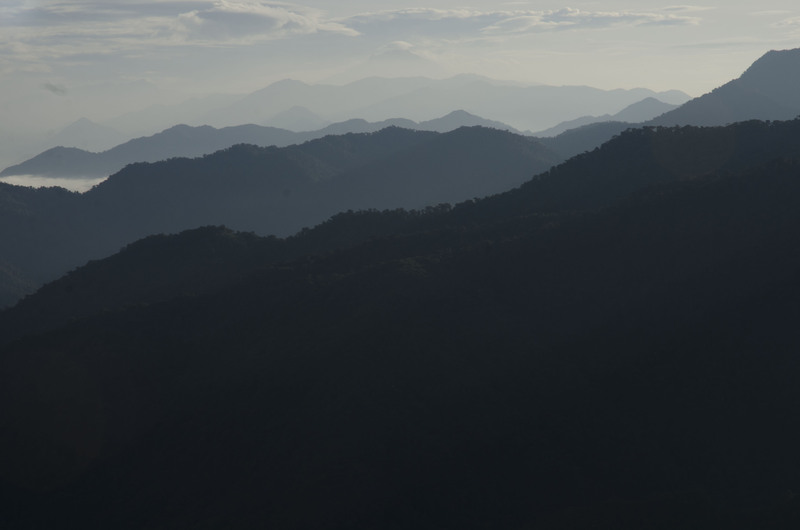 In the early morning light, it was possible to see as many as 10 mountain ranges, if you included the one where we stood. And in the early afternoons you could watch the clouds form and change in the distance. Each time, the view was different and each time it was impressionable. The Andes or La Cordillera Andina. A view from the road looking up into the trees. The Sickle-winged Guan hanging out by the compost heap. The second open area was near the compost heap alongside a back trail. We never failed to see the Sickle-winged Guan in these parts and we caught a glimpse of what I think was a White-throated Crake, best identified from over-exposing a photo we took of it in the gloom of some very heavy brush. His speckled tail stuck out though the rest of him remained hidden. 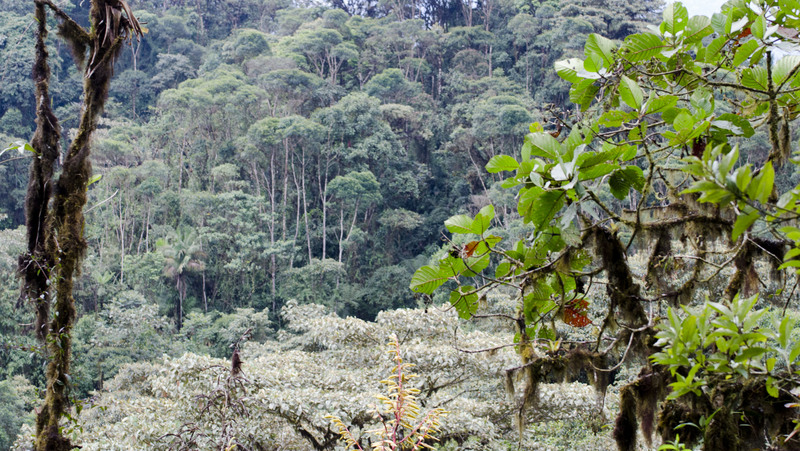 In this area, we also saw a female Masked Trogon hunting insects. She would sit ever so patiently on a branch, almost posing for pictures, then suddenly she would be off, grabbing some flying insect out of the air before settling on a new perch. We were lucky to see her again by the Lodge on a very rainy afternoon; we decided not to hit the trails for fear of slipping and falling on the mud. The trails at Bellavista, though well maintained, can’t soak up the massive amounts of water that fall in a single afternoon rainshower. 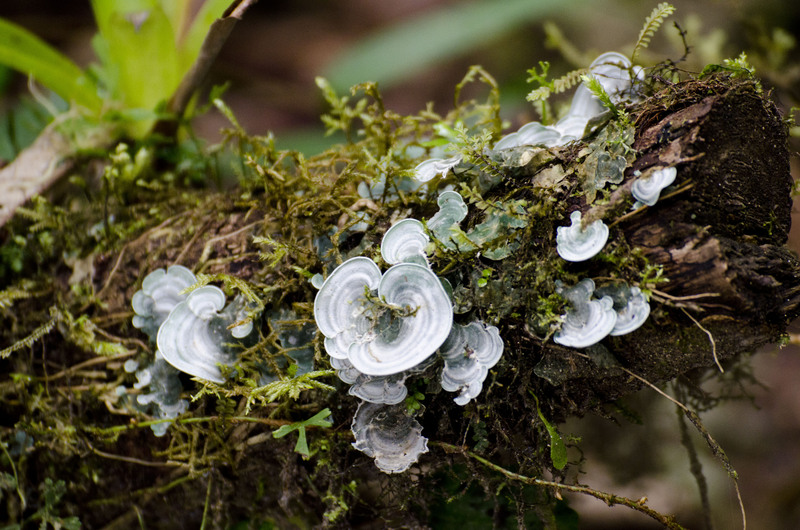 A green-blue lichen found in the primary forest. The third open area was at the very top of the reserve, a trail that passed through old orchards and farmland. Here the forest had yet to return and we were able to see some birds in the brush as well as see the most intricate orchids hanging off large trees. Our guide on this day was also able to show us the interconnected web of this land as the hike took us through almost every habitat in the area – he pointed out spiders mating among the leaves of a bromeliad; he caught a small frog living in a boggy area by the trail; he taught us about the sap that comes from the Dragon’s Blood Tree as red as you can imagine and found only in primary forest; we learned of Witches’ Fingers, poisonous purple fruit that look almost like hot peppers, and Inca Earrings, pink flowers that dangle from bushes. 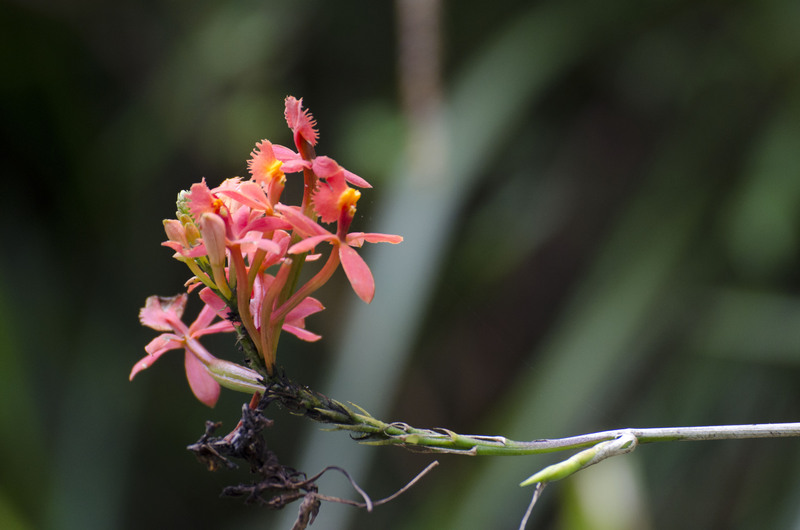 Although there is a season for orchids, it is possible to see them year round. A close-up of a gorgeous wild orchid. One variety of Inca Earrings – there are many more. 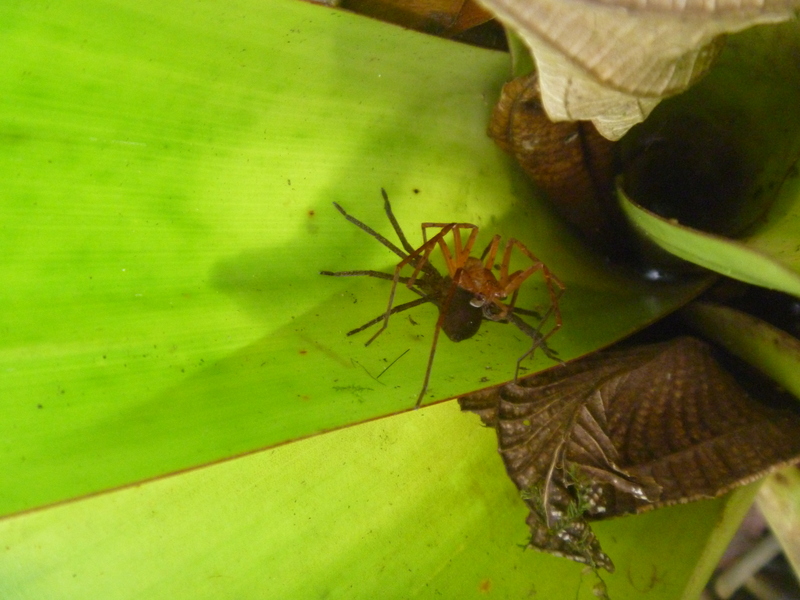 Mating? Fighting? Dining? Your guess is as good as mine. 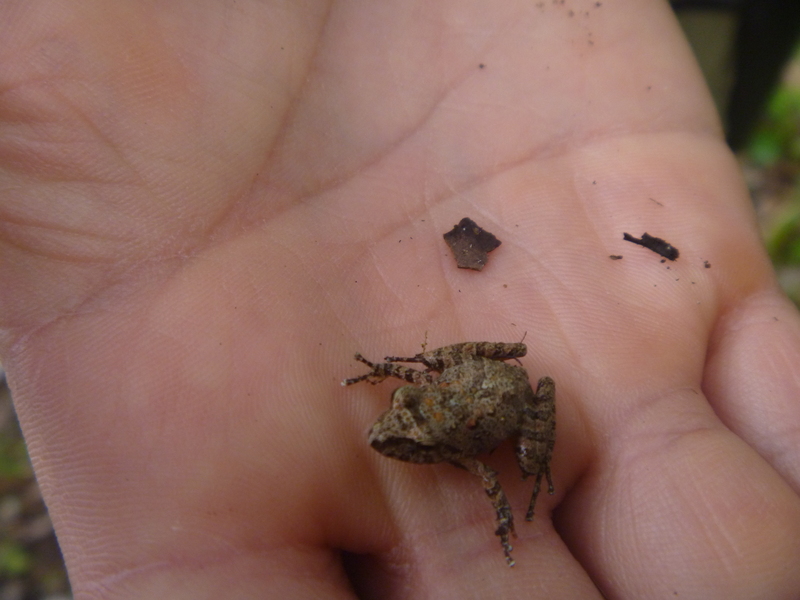 A small frog – the only one we saw though we heard many more. In short, we only saw a small part of the reserve. Trails criss-cross the land and each one offers a new and exciting adventure. 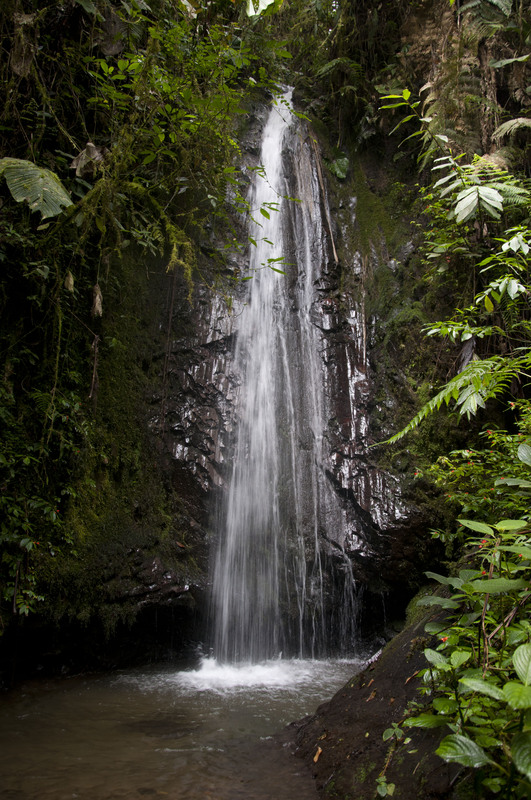 We want to return and head up to the high view point of Trail W and visit Discovery Falls of Trail D. It’s one of the benefits of living in a foreign country – once you find a great place you love, it is easy enough to return and continue the adventure. 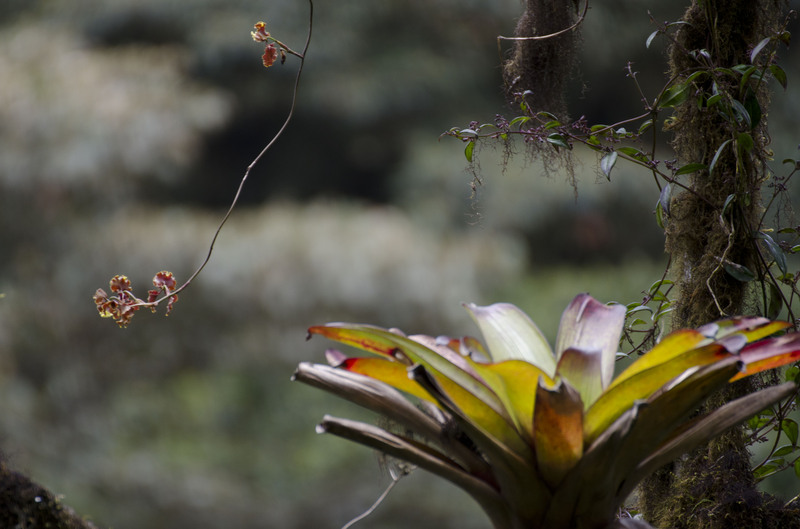 If you missed Part I of our adventure, please take a look at Bellavista Cloud Forest Reserve and take a peek at the beautiful hummingbirds we saw near the feeders. Yeah, Miko when can we go visit? THAT PLACE IS SOOOOO COOL! When can we visit?